It’s been almost two years since I spoke to Jill Carter. Back then, it was a podcast to discuss her directing work on Spiral, a creepy web series. We also talked about her experiences directing episodes of Murdoch Mysteries and how she got into the Canadian television industry in the first place. How did you get involved in The Murders? Had you worked with Damon Vignale before? Jill Carter: I’d actually never met Damon. My agent was dogged about pursuing this for me. The producers and Damon and Rogers were interested in discussing the show with me, and so they sent me the bible and the pilot episode, and I read it a couple of times, and did some homework in terms of what kind of police homicide detective shows I thought were interesting and maybe kind of relevant to the type of show that they were discussing. Damon had mentioned the show Marcella to me. So, I looked at that and then I looked at a couple of others that I also liked. Actually, they were all British shows. And then, I let my imagination run wild and had a good conversation with the Muse producers and Damon and they, in the end, obviously, we’re happy with how that conversation went and were interested in hiring me and then they asked me to do one more thing before it could become official. They wanted me to do a look book, which was to basically create a document that represented what my thoughts and visual ideas would be in terms of how I would approach the show. What was in your look book? JC: I pulled some reference stills from the shows that I was inspired by, and also the show that Damon had talked about, and ones that I liked the framing of or the colour palette of. We had also talked about wanting to have a very different take on a police station. I’m really pleased because I think we ended up achieving that. I had pulled some references for police stations, but not specific to that. I actually found, in Dwell magazine, an old post office that this digital company had repurposed, that looked really cool. I thought could be an interesting space or reference for a space for a police station. And then just shots of Vancouver and the diversity in culture and the diversity in landscape, and sort of the beautiful, soft colours of the west coast. But also the sort of darkness and rich colours of the mountains and when you get those rainy grey days, that kind of colour palette. I basically pooled all of that and then hired a graphic designer to work with me on creating a pleasing book that would represent the show’s feeling. At the end of the day, you want to create something that people can really get a sense of the feeling and the tone and the style that you want to embody. Is this the project where you had the most input? JC: I never had that much input on a show before. And obviously, every show that you direct, they’re hiring you for a reason, so you try, within the sandbox that you’re given, to infuse your own taste and style and artistic value to that show. But you’re dealing with, as the director that followed me on The Murders, was they had to sort of follow what we had set out to be the tone and the style of the show. Which is fun, and it’s you trying to find a way in on something that already kind of exists, so it’s a different sort of challenge. But, obviously, the most fun is when you can really have a hand in creating something and having the most ability to weigh in on what the sets are gonna look like, what locations you have. You always have that when you’re directing, but if you’re directing a show that’s already in place, you haven’t picked any of the original locations, you’re just handed whatever doctor’s office or police station you’ve been given. I really got to, with Damon, go and decide. We saw a bunch, and there was a couple that we saw that was already dressed as police stations, and I’d look at him immediately and be like, ‘Nope,’ and he would agree. The two of us were very much on the same page about it. And we’re excited to find something different that we hadn’t seen before. And I think we really did that. One of the things that I loved about our police station is that it’s right at street-level, and you see traffic passing by. I think it adds a real authenticity to the fact that they’re working in a location that they’re also servicing for their job. You feel like they’re in the thick of it, and it just adds another layer and sort of nuance to the scenes that are in the bullpen, and also give a buzz almost, like an extra something to every scene that’s there, and just life that you don’t often get a chance to see when you’re in those type of sets. I loved that element. What are some of the unique challenges of filming in a city, on location, at night? JC: The biggest challenge is time because you have restrictions in terms of the hours that you can be shooting. So that, I’d say, is kind of the biggest factor, because how you’re shooting or where you’re shooting really kind of remains the same in terms of like whatever situation you’re gonna have to deal with. It’s really just the restriction on how long you can shoot in that location. A question about Jessica Lucas. People know her as an actress, but she’s also a producer on The Murders. What was it like working with her? JC: As an actress, she’s incredible. She really carries the show. Her character is quite stoic and very internal. Everything’s sort of kept close to her chest, and you know she’s very protective and very serious about what she’s doing. And Jessica is very expressive as an actress, and her face says a lot. Her style and ability as an actress really lends itself well to this character and was wonderful and really killed it, I think. As a producer, she was open and collaborative and really, I think for her, was an opportunity to get her feet wet in an area that she’s interested in and would probably like to do more of. It was starting out in a space that she’s comfortable, meaning a show that she was working on as an actress as well, I think helps pave the way. It was an opportunity to have a larger voice in terms of weighing in, especially on the script and in the story in terms of in pre-production and production, on what she felt was working or needed to be maybe adjusted for her character. But, also, the script as a whole, and wanting to make sure that we were all moving forward in the same direction, in the right direction, and having discussions about wardrobe and things like that. Getting more into the nuts and bolts of stuff that you maybe don’t normally get a chance to do as an actor for hire, when you’re not producing as well. What can viewers expect as they get into the second episode and the meat of the season? JC: If you saw the first episode and the preview of Episode 2 coming on Monday night, you’ll know that it’s a bank heist, and I had a ton of fun directing that. I’d never done one before, and that was super fun to do. All of my episodes have been different and fun. We learn more about Kate’s past and her family relationship. And also you start to understand the dynamic of the group of detectives that are working together. If you’ve seen Episode 1, you know that we don’t shy away from presenting images that are difficult or challenging. That stays through the entire season, so I think people can be looking to be gripped and excited and presented with entrusting ideas and also just get to know our characters a little better. The Murders airs Mondays at 9 p.m. ET on Citytv. Images courtesy of Taro PR. When we last left Declan Gardiner, he was alone. Everyone associated with him in Season 1—Vito Rizzuto, Bruno Bonsignori, Gio, Nicolo Rizzuto Sr. and Gio—were dead and someone was, literally, gunning for Declan. In the season finale’s final moments, a gunshot rang out. Was Declan dead? Nope. Declan is alive and well. And, when viewers meet up with him in Season 2 of Bad Blood—returning Thursday at 8 p.m. ET/PT on Citytv—he is still on his own. A lone wolf. Just the way he likes it. Season 1 of Bad Blood was based on real life, the story on Montreal mob boss Vito Rizzuto (played by Anthony LaPaglia). It was adapted by Simon Barry (Continuum) and Michael Konyves from Business or Blood: Mafia Boss Vito Rizzuto’s Last War by Antonio Nicaso and Peter Edwards. But the sophomore eight instalments, written by Konyves, Alison Lea Bingeman and Patrick Moss, go off in a brand-new direction, following Declan’s adventures. Half a decade later, Declan is running his own squad. That, of course, attracts some unwanted attention. Cue a new group of mafiosos from Calabria, Italy, to Canada in the form of twins Teresa (Anna Hopkins) and Christian Langana (Gianni Falcone). Once they arrive, the Langanas present themselves to Hamilton, Ont., brothers Domenic (Louis Ferreira) and Enzo Cosoleto (Daniel Kash) and their sons, Luca (Franco Lo Presti) and Nats (Dylan Taylor). Together, the sextet takes aim at Declan. Meanwhile, the Organized Crime Task Force gets ready to take everyone down with the help of a confidential informant. Although he prefers to work alone, Declan realizes that, in order to remain on top, he’ll need to enlist some help. To do that, he partners with Rose Sunwind (Sharon Taylor). Like Season 1, the second of Bad Blood was filmed in and around Sudbury, Ont., and Montreal. That meant a return to the cold Coates dealt the first time around. And while he hails from Saskatoon, Coates admits the years in Hollywood have had a dampening effect on his endurance with dropping mercury. Bad Blood airs Thursdays at 8 p.m. ET/PT on Citytv. Images courtesy of Rogers Media. Scott Moore, President of Sportsnet & NHL Properties, has announced his decision to leave the company at the end of October. During his eight-year tenure, Moore repositioned the sports and TV businesses to address the evolving media landscape and viewing habits. He championed the acquisitions of The Score and Grand Slam of Curling; brokered the deal that brought the FX brand to Canada; launched North America’s first direct-to-consumer mainstream sports product with SN NOW; created Rogers Hometown Hockey; and played a key role in helping Rogers secure the blockbuster 12-year NHL deal. Now celebrating its 20th anniversary, Sportsnet is well positioned for continued growth and success, with a strong team in place to carry the momentum forward. The search is underway for Moore’s successor. In the interim, Brace will oversee Sportsnet in addition to his current role. Breakfast Television Toronto is another member down. 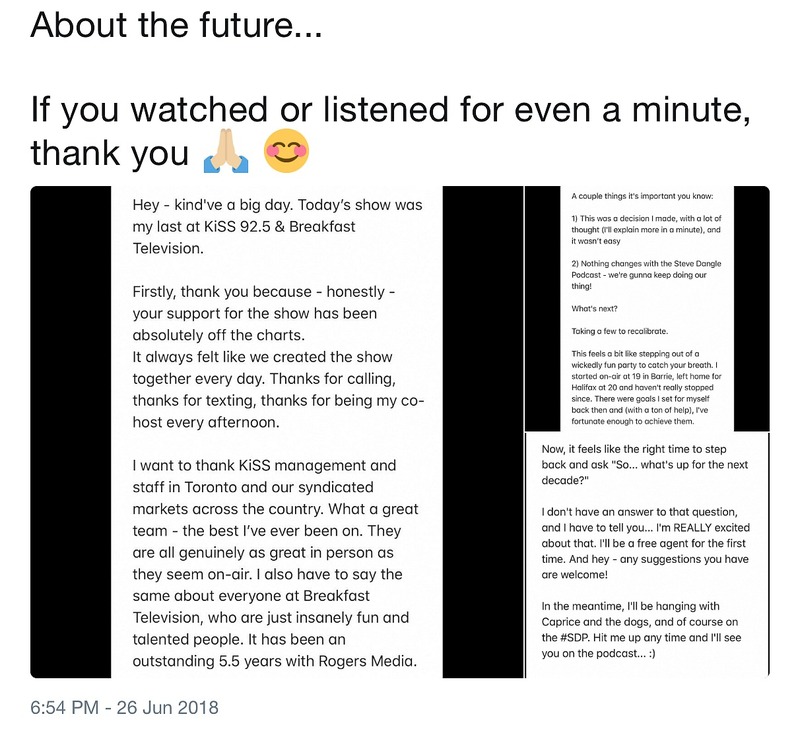 Less than a month after Kevin Frankish exited Citytv’s early morning program, Adam Wylde took to Twitter to announce Tuesday was his last day. “This was a decision I made, with a lot of thought,” he continued. “And it wasn’t easy.” You can read his full statement below. Friday, June 1, marked the last day of Kevin Frankish’s career at Breakfast Television. He had been at the helm of the flagship morning show since 1994 when he replaced David Onley. Back in 2016, Jennifer Valentyne departed the program due to a programming change, followed by Tanya Kim last year. Image courtesy of The Academy.